DSW, Oracle, and Tiffany are likely to make big moves over the next few trading days. Stocks took a break from their rally last week as both the Dow Jones Industrial Average (DJINDICES:^DJI) and the S&P 500 (SNPINDEX:^GSPC) fell by less than 0.5%. 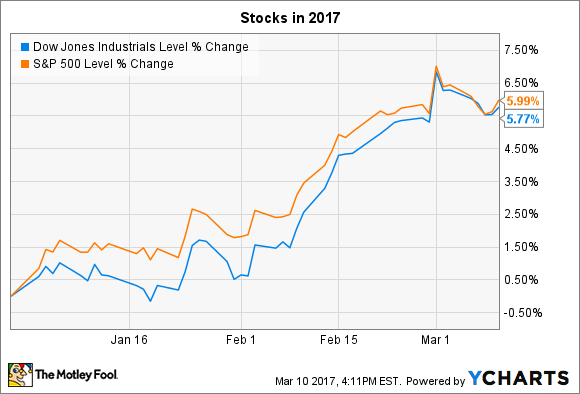 The two indexes remain roughly 6% higher year to date. Earnings season is winding down, but there will likely be big swings in a few individual stocks this week. Some of the most anticipated reports on tap include those from Oracle (NYSE:ORCL), DSW (NYSE:DBI), and Tiffany (NYSE:TIF). Footwear retailer DSW will post its fiscal fourth-quarter results before the market opens on Tuesday, March 14. The stock is down sharply since its last report as investors worry that weak shopper traffic hurt sales and profit growth over the critical holiday period. DSW's last report was mixed, headlined by a disappointing 2% drop in comparable-store sales. However, tight inventory management and a lessened reliance on markdowns allowed both gross and net profitability to improve. After four-straight quarters of falling earnings per share, DSW posted a 16% profit bounce in the third quarter. "This quarter reflects the first step in our return to year over year earnings growth," CEO Roger Rawlins said in a press release. This week, investors will be looking for continued progress on the bottom line. Yet the stock isn't likely to break out of its sluggish trend until the company shows that it's at least on track to return to sales growth. Oracle is set to announce fiscal third-quarter results on Wednesday afternoon, and investors are optimistic that the software giant will show improving operating trends. Sales growth should accelerate to a 3% pace according to consensus estimates, which would mark a solid gain over last quarter's 1% uptick. As usual, cloud services will play a key role in the report. Both its software-as-a-service and platform-as-a-service segments grew at better than an 80% pace last quarter, and if they improve on those results this week, it will mark the fifth-straight quarter of accelerating sales gains. "As we get bigger in the cloud," CEO Safra Catz said in a press release, "we grow faster in the cloud." Rivals are all attracted by those awesome growth rates, and so Oracle will need to continue pushing its size advantage to soak up market share. Profitability will be important to watch, as well, since sales gains are less impressive if they only come at the expense of declining operating margin. So far, that hasn't been the case. Profitability rose by nearly a full percentage point, to 34% of sales last quarter. Luxury jewelry specialist Tiffany has seen its stock rally to a 52-week high heading into Friday's results. The optimism isn't tied to operating trends. In fact, in early January, the retailer warned of surprisingly weak sales growth for the fiscal fourth quarter. "Holiday period sales results were somewhat lower than we anticipated," CEO Frederic Cumenal told investors. Worse yet, the team expects the weak industry trends to continue into 2017. Still, investors are finding reasons for hope that a management shakeup could produce the turnaround they've been waiting for. Cumenal announced in February that he's stepping out of the chief executive role just as the board of directors welcomed three new members. The broader challenge ahead for Tiffany's new executive team will be to return to sales growth after years of disappointing results, despite a soft sales environment in the global luxury jewelry market.